Sometimes I am really lucky with my designs. I mean everything comes perfectly together and my very first prototype/sample goes off without a hitch. Other times it can be like trying to get a square peg in a round hole...and I am that kid that is too stubborn just to try the round peg and go with it. I feel like almost anything can work, but who really wants a pattern that is 27 pages long in a 7 point font with 13 different charts? 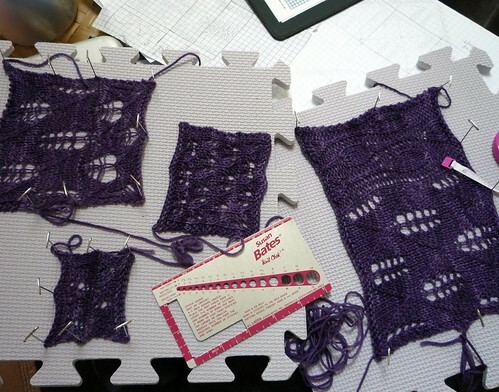 I try to get my lace patterns down to a more concise form that doesn't send the average knitter running and screaming. 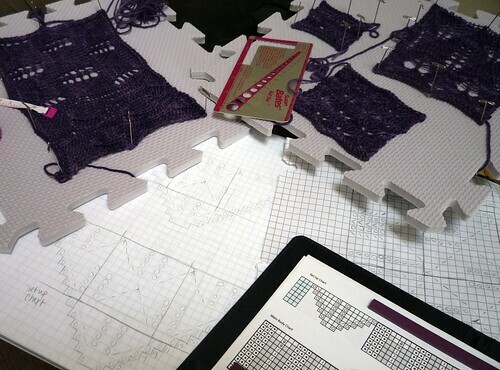 Daphnaie should have been easy enough, though while I was in the initial designing phase, I was blissfully ignorant of the nightmares that double sided lace repeats can cause. Then trying to fit the repeats of the center panel in with the awkward repeats of the lace pattern just added to my frustration. 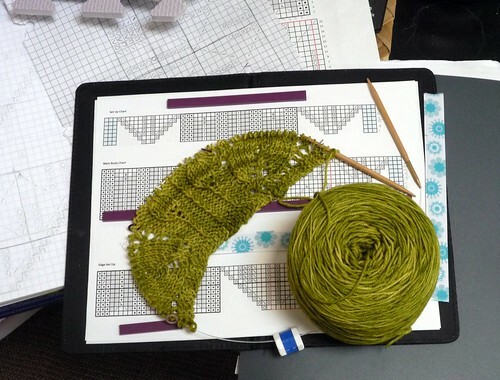 So I charted on paper and in Excel until I had filled pages of tiny grids with tiny little symbols that only knitters can understand and I added and multiplied and divided and subtracted. Next, I swatched and swatched and swatched. Then I ripped out some swatches and swatched some more. Finally there was a pattern I liked and, with some tweaking to it and my center panel, it all worked together wonderfully. Like really wonderfully awesomely...so much so, I impressed myself. Not so much because it is some monumental piece of knitting, but because I didn't opt to take the round peg and give up on my idea, I took a chainsaw and made it work...and it is almost exactly as I envisioned. For a long time the vision was all I had too, it was just a sketch on a piece of paper for months and when I went back and looked at it with Daphnaie all charted out, it was so perfectly right. I just wanted to share my excitement with you guys and give you a little peek at what I have been up to. Also, a big thanks to everyone that has purchased patterns so far. There is one week left, then I will be tallying up the sales and making the donations! A little help for Japan.